FILE - Relatives carry the coffin of an Afghan National Army soldier killed in a Taliban attack in Takhar province, Afghanistan, April 23, 2017. On Thursday, a Taliban raid in Takhar province killed 16 Afghan forces. Taliban insurgents in Afghanistan have attacked and killed at least 16 government troops in the northeastern border province of Takhar. Provincial authorities said several security personnel also went missing following the pre-dawn raid against a police outpost in the Chah Aab district which borders with Tajikistan. Provincial government spokesman Sunatullah Temor told VOA insurgents overran the Yateem Tapa post after a brief encounter with Afghan forces. He confirmed seven missing police personnel re-established contact with their headquarters early Thursday. Taliban spokesman Zabihullah Mujahid confirmed its fighters carried out the attack. 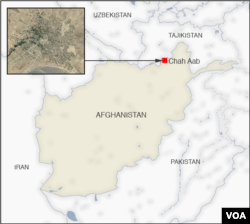 Afghan officials have alleged that Central Asian “terrorists” are also fighting alongside the Taliban in Takhar. Separately, a bomb ripped through a meeting of “peace activists”, killing at least eight people Thursday in the southeastern Afghan province of Logar. The presidential palace in Kabul confirmed the bombing in the volatile Charkh district, saying it has "martyred and injured" civilians, but the statement did not mention the number of casualties. Insurgents have killed scores of Afghan personnel in attacks across the country since ending their temporary cease-fire during the three-day annual Muslim festival of Eid-al-Fitr earlier this month. The unprecedented suspension of insurgent hostilities had come in response to a weeklong Afghan government cease-fire that was later extended for 10 days and is due to end on Saturday. Afghan President Ashraf Ghani on Wednesday again urged the Taliban to extend their cease-fire and said he is ready to hold peace talks with the leader of the insurgency, Hibatullah Akhunzada, "anywhere he wants." But the Taliban dismisses the Afghan government as an American "puppet" and has been demanding direct negotiations with the U.S. to end the conflict. Washington refuses to hold talks with the insurgents and insists the peace process must be "Afghan-led and Afghan-owned."